In retrospect, it would have made a great comedy skit. However, at the time, I found the situation somewhat less than humorous. Leading the way to the iceberg-filled lake at the foot of mighty Mount Cook on a private tour of New Zealand, I was surprised to find a couple of new bridges on the route since my last visit a year ago. The biggest change though was a completely different final path which brought us to the opposite side of the lake of where it had previously ended. On arrival, I was delighted to find the lake filled with more chunks of ice than I had ever seen there. Furthermore, the new vantage point opened up the view towards Mt Cook considerably more than the previous one. I explored along the lake’s shoreline scanning for pieces of ice conducive to a decent composition. I finally settled on two smallish chunks with a nice crystalline texture to them. The sky was looking promising for sunset. Now the water in this lake is just about as cold as you can get without freezing over. From previous experience I knew it was going to hurt like hell initially and then after 5-10 minutes the feet go numb. Going barefoot for more than 15 minutes would no doubt be associated with some risk of tissue damage. I watched the sunset with the plan that as soon as the light was approaching its peak, I would get into the water, get my shot and leave with the minimal amount of discomfort. When the time came, as nobody was nearby, I decided to strip down to my underwear Walter White style (except with more fashionable smalls) and enter the lake. Carefully I set up my tripod on the rocks sitting at the bed of the lake. Crouching over to make the best composition available, I could feel icy water up to my thighs and then a shock as it reached the seat of my underpants. I looked up to make my first exposure; clouds radiating from the peak of Mount Cook were turning pastel pink. The only problem was that suddenly my foreground subjects had vanished. I turned around to see the two pieces of ice slowly spinning downstream behind me. I desperately lunged at the nearer one and managed to push it to a more secure position closer to the lake edge. By the time I had re-assessed the situation, the quality of light had diminished significantly. Although disheartened by the awry turn my plans had taken, I did the best I could with the scene at hand. I wanted to at least come away with something for all my troubles. Gear and stuff Over the past couple of years I have been downsizing my gear as much as possible for travel and landscape photography. First, I knocked off my fast telephoto zooms and primes. I’m now down to a 16-35mm, 24-105mm and 70-300mm to go with my Canon 5DMk3. Finding a tripod light, versatile, compact and stable enough for landscapes and seascapes has also been on my agenda. I think I’ve finally found a suitable one that fulfills all of these requirements, the TQC-14, the smallest tripod in Really Right Stuff’s range. There were several recent occasions where I had to run trails at a fast pace to chase down the light and believe me my legs and back thanked me. RRS’s compact ballhead, the BH-30 with quick release clamp was a perfect match for this tripod which connected to my DSLR via their L-plate for the 5DMk3. So far, they have passed the test with flying colours in the Scottish highlands, the rugged Isle of Skye as well as my latest trip to New Zealand where they had to perform in the Southern Alps and numerous coast locations. 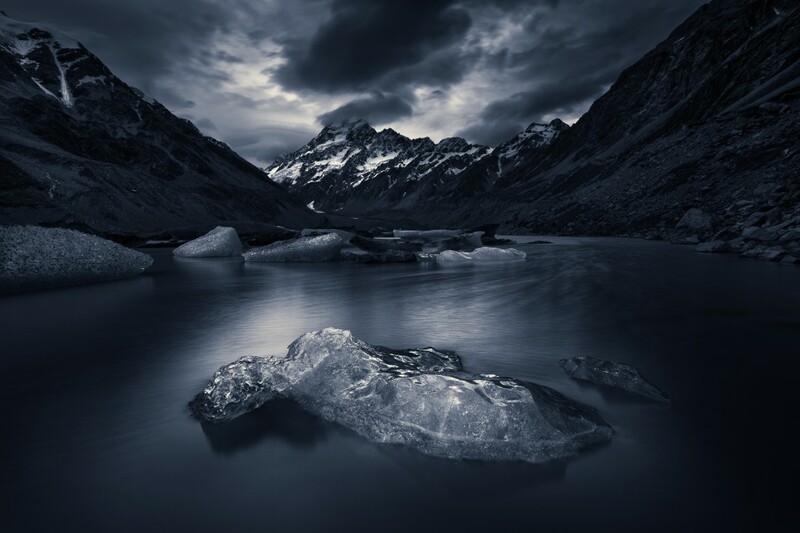 Images and words Copyright ©2014 Kah Kit Yoong. All rights reserved. That was a very good read, and humorous to. I can totally understand what you say about the cold, it isn’t too bad when the initial burn numbs down. Anyway I think this picture was totally worth your troubles. And you are a Walter White, working with so much ice! I really love this, the light and the processing you’ve done really make for a striking image! We live on the North Island, really must make more of an effort to make it down south! Beautiful! 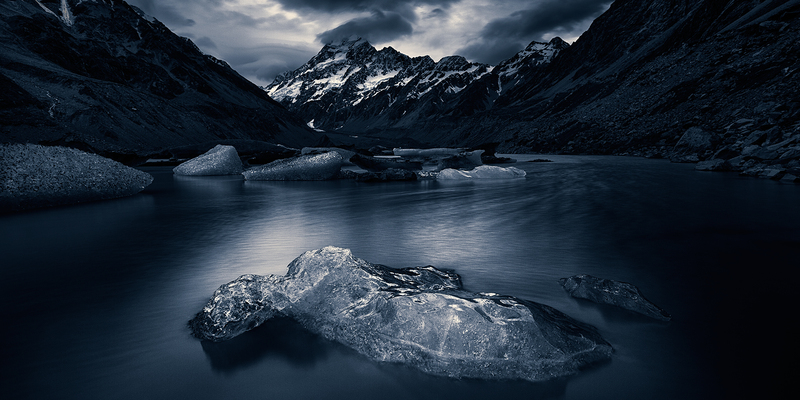 Did you apply a significant amount of dodging to lighten the foreground ice? I did not Andrew, the light on the ice comes from the reflection of the cloud above onto it.